Have you ever wished your home looked like a cleaning crew came in and cleaned it for you? ​​​​​​​Well, there is a way to get that job done easier and make your home sparkle. There are some amazing House Cleaning Tricks that professional house cleaning crews use. And, today I am going to share some of their secrets. Having everything in a handy portable caddy prevents you from having to stop cleaning. Make sure you have have everything you need to clean your home and that you can carry it easily from room to room. I prefer a plastic one with a handle. I actually keep two of these. One for upstairs and one for downstairs. Because well I have three kids and a cat (wink). If there is something I have to clean up right away I don’t have to run up and down the stairs to get my supplies. These cleaning totes are part of every a professionals best house cleaning tricks. They are looking for speed and this makes it so much easier! Find an all-purpose cleaner that works for you. One that can disinfect your bathrooms and kitchen but also one you can use on glass or wood surfaces. I find the Mrs. Myers brand to work for me but there are so many DIY all purpose cleaners you can make. A simple search on Pinterest and you can find many recipes for all-purpose cleaners. For many years I have gone back and forth on the room to room idea of cleaning. But when I tried this house cleaning tricks from the pro’s I never went back. I found that my brain works better when I clean by task instead of room. So by grouping all the dusting and wiping surfaces together, mirrors, toilets, you get the idea. When I have completed all the tasks for cleaning I then will vacuum and mop very last thing. Spray your surfaces, shower and toilets first. That way you can let the cleaner do it’s job and less scrubbing for you. Then come back and simply wipe away. The best house cleaning tricks come from keeping it simple. That way you can get done faster. When I clean my home I not only start each room in a circle by each floor too. I start with one room and work my way around the house moving from room to room in a clockwise motion. I do the same thing in each room as well. By starting at the door in each room I work my way around that way nothing gets missed. I am able to move faster while I am cleaning. Check out my monthly cleaning schedule + printable checklist! I use microfiber cloths almost everywhere in my house. They are great for dusting, wiping surfaces, and shining up those stainless steal or chrome items. Since I am using an all-purpose cleaner mostly, I do not have to worry about my cloth getting other cleaners on them. They work amazing and you can save money in the long run by not having to buy as many paper towels. I do not use a microfiber cloth on my toilets or areas I feel need a disposibale cloth. This is one of those house cleaning tricks that is so quick but can make all the difference. Grab those microfiber cloths and shine away. You will not believe the difference shiny appliances in your kitchen make. I simply use a wet microfiber cloth and then buff it out with a dry one. A simple task in under 5 minutes! When it comes to cleaning your home you should be focused on actual cleaning not picking up. Usually I enlist my kids since most of it is toys or their mess that has been strewn about my home. A catch all bin comes in handy here too. Before I clean anything I will go room to room clearing countertops, straightening areas and picking up whything that does not belong. Those items that do not belong wind up in my catch all bin to sort out later. This is my best time saving house cleaning tricks! I seriously could kick myself for not doing this sooner! Invest in an extension cord for your vacuum, you will be so glad you did! Instead of stopping every room or pulling out the plug having to walk back to find another outlet. You can easily vacuum more surface area with an etension cord. Just as I talked about how you should clean in circles you should also complete each floor. If you have a two or even three story home work your way from the top floor down. I work on my second level first before moving to my main living area. Each floor os done in cicrles and complete and I can move on easier. Just as in starting from the top level of your home you should also do this while you are working in rooms. If you are dusting the celing fans or vents that live in the ceiling do those forst before you would dust surfaces. That way the dust falls down each time you are working on a section. If you dusted your surfaces first then went back for something higher there is a good chance dust will just wind up back on the lower surfaces you just cleaned. What are some of your house cleaning tricks you use to get the job done like a pro? Do you need to clean your house fast? If you have one hour I can show you how! As much as we try to maintain a clean and tidy home there are some days where as much as we try it just can get trashed. If you are anything like me on those days the mess can become overwhelming. Maybe this week you could not keep up with your weekly cleaning routine and just need to tame the mess. I truly get anxiety when I see every room looking like a hot mess. I function better in clutter-free spaces. So if you need to clean your house fast I got you covered momma! It’s called speed cleaning and what if you could clean your whole home fast, I mean in under one hour. The thing about speed cleaning is we are not looking to deep clean or perfect cleaning here. We are just looking to get the job done and fake a clean house in under an hour. It will do wonders for your anxiety if you get like me and can not function in mess. Set a time for one hour or less if you can not devote the full hour. Setting a timer will make you work faster and you know you are up against the clock. No stopping to check Facebook or answer your phone either. Use this hour wisely. Do not worry about places that have a door like your kid’s rooms, your bedroom or other bathrooms in the home. If you have the extra time on your timer you can tackle those but this is just for the main areas of your home. Grab a catch-all bin and grab everything out of place like toys or anything that belongs in another room. Simply toss those in your bin. You can sort them out when you are done or hand them off to one of your children to sort for you. There is something that says your house is clean when you walk into a clutter-free wiped down kitchen. Spray all the countertops and give them a quick wipe down. Quickly wipe the surfaces of your appliances. Load the dishwasher with those dirty dishes in the sink and give your sink a quick wipe down. This all takes no more than 10 minutes and no one will know you tried to clean your house fast. First, clear any clutter from the space. Give the guest bathroom of your home a quick wipe down. Wipe the mirror, sink and give the toilet a quick swish and wipe. If your bathroom has a shower leave it again we are looking to clean our home fast not a deep clean. If you have a glass shower just wipe down the doors to make it shiny. Since you already cleared all the clutter with your catch all bin these rooms are easy peasy. Grab a microfiber cloth and wipe down the surfaces. Fluff the pillows and cushions on your couches. No need for sweeping just grab the vacuum and vacuum everywhere in your main areas. Remember to move fast and just do the main traffic areas. I have recently picked up this Shark vacuum and LOVE it! It works great on hardwoods and carpet. I go through vacuums like crazy and this baby has stood the test of time for me! Now if you have more time on your timer you can pick up the other areas in your home but this is just a general clean of the main area to clean your house fast. Or you can quickly sort your catch-all bin! Do you have anything to add to clean your house fast? I’d love to hear them in the comments below! There are tons of tiny tasks that need to be taken care of around the house on a daily basis, and it can be hard to keep up. Bathrooms, which should get a deep clean at least once a month might go three or four without even being touched by a mop or a sponge. Putting together a simple list of cleaning tasks in the bathroom can make the job much more straight forward and easier overall. To clean the bathroom like a pro, you’ve got to hit all of the normal spots including the mirrors, floor, sink and bathtub, but there are often a few key spots that people miss. Make sure you hit these locations on your next bathroom roundup for the most comprehensive clean. Combs and brushes can get clogged with hair and hair products like mousse and hair spray. To clean them properly, run a fine toothed comb through each tool to get the hair out, then put the items in a large basin filled with warm, soapy water. The drain stopper that sits down in your sink drain can get extremely clogged and dirty in no time. To clean it, remove the stopper and soak it in a solution of baking soda, vinegar and water for about an hour. Remove the stopper, and scour it with a sponge to remove the excess gunk. and bulbs can be the dustiest, grimiest areas in a room. Don’t forget about these places in your bathroom by swiping them with a damp cloth each time you clean. If fixtures have dead bugs in them, you’ll need to unscrew the attachments, empty the bugs into the trash, and soak non-electrical items in sudsy water for about twenty minutes before drying and replacing them. 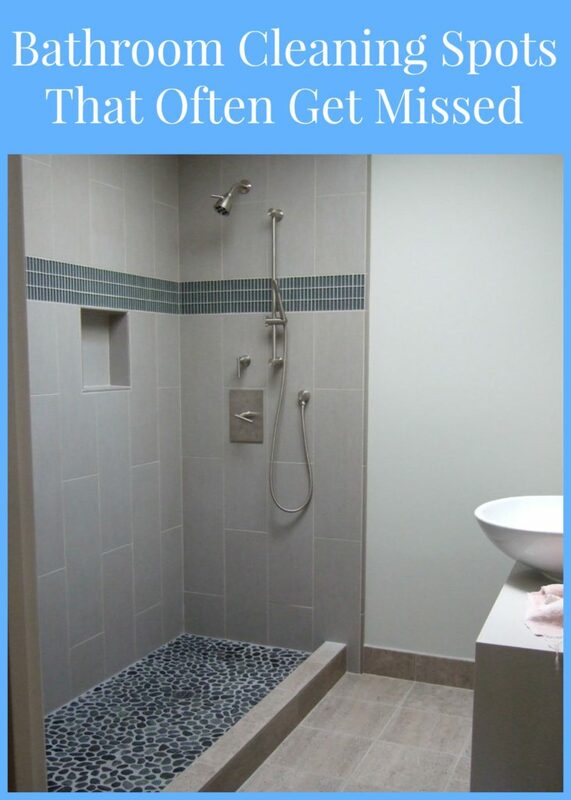 Bathrooms and especially shower rooms often have fans for exhaust. These can get dusty and grimy in no time flat. According to Grimebusters Ltd if you don’t take care of these fixtures often, that dust and grime can turn sticky and hard to remove. Clean exhaust fans by dusting first, and then using a soapy sponge to do the rest. If you’re still having trouble cleaning your bathroom to the full extent, consider hiring a maid from an Edmonton maid service. Maids have been trained in all of the cleaning methods listed above and more. Follow the advice above or hire a maid service for your bathroom cleaning routine, and you’ll have the most spotless bathroom in town.